Learn more about TritonEd, student access, and other integrated tools. For known issues and error reports, see TritonEd Known Issues. TritonEd course sites are automatically created each quarter. If the instructor chooses to make the course available, only students who are enrolled in the course will have access. Sites are created during the ninth week of the previous quarter, and are only created when all information is present in the Schedule of Classes. Once the TritonEd site is created, the instructor will receive an automated confirmation email notifying the instructor of its availability in TritonEd. By default, the course is hidden from students until the instructor makes the course available. The student roster in TritonEd is automatically updated for each course. Once students are added to a course, they can access TritonEd with their UCSD username and password. Students who officially enroll in the course through TritonLink are added to TritonEd by the first day of class. Students who register late are added to TritonEd within one business day after enrolling. Waitlisted students are automatically given access (you can opt out by emailing edtech@ucsd.edu). Dropped students and students who remain on the waitlist are removed from the course after the add/drop period concludes - at the beginning of the third week. This does not apply to Summer Session. Concurrent enrollment (Extension) students are not added automatically. Extension students should obtain a registration token from Extension's student services and register for a Concurrent Enrollment Computer Account. A Student Preview button is now available in TritonEd. Instructors can can easily toggle between instructor view and student view by clicking the Student Preview button at the top right of the TritonEd site. The Student Preview button allows the instructor to view the course from a student's perspective, and complete assessments and activities that are available to students in the course. Instructors also have the option of keeping or deleting the test-student's activity when exiting the student preview. Select the Student Preview Icon on the top right of the screen. The yellow bar at the top will indicate that the Student Preview is ON. Navigate the course and complete assessments to experience the course from a student's perspective. 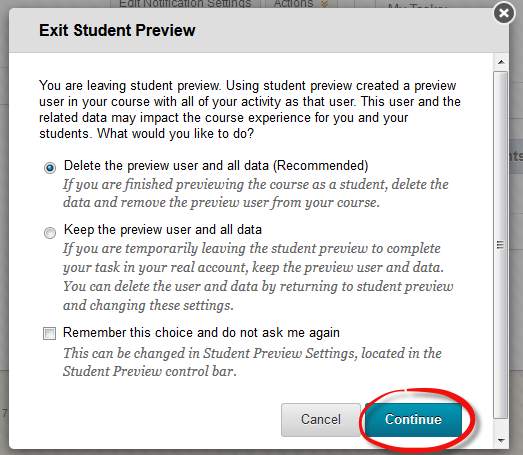 To toggle out of the student preview, click Exit Preview at the top right of the screen. A pop-up window will appear with the options to keep the preview student data or delete the activity. Keeping the data will allow the instructor to view and grade the test-student's activity in the instructor view. Select the appropriate option and click Continue. Instructors can limit which courses they see in their Dashboard by navigating to the Manage My Courses Module Settings and deselecting courses to hide them. The My Courses Module Settings also allows instructors to reorder their courses, and specify which information about a course is displayed in the Dashboard. In the TritonEd Home Page, select the Gear Icon in the right-hand corner of the My Courses module. The icon will be hidden until it is hovered over with the cursor. Under Courses you are teaching, use the checkbox to the left of each course name to deselect courses to hide them from view on the Dashboard. Note: To view only specific details about a course, select or deselect options to the right of the Course Names. Deselecting a course will deselect the options to the right. i>clicker is a student-response system for in-class polling and quizzing. i>clicker helps engage students and gauge their level of understanding. Instructors can email clickers@ucsd.edu or call (858) 822-1456 to request an i>clicker Instructor Kit and receive basic technical training. For more information, visit clickers.ucsd.edu. Scores from your in-class i>clicker sessions can easily be synced with your TritonEd grade center. To learn more about i>clicker/TritonEd integration, go to Using i>clicker with TritonEd. Turnitin is an assignment tool that enables originality checks and online grading. Turnitin is currently integrated with TritonEd (the campus learning management system) and faculty are encouraged to use Turnitin through TritonEd. See steps on how to create a Turnitin Assignment in TritonEd and learn how to use the new Feedback Studio for grading. Turnitin is currently available through TritonEd (the campus learning management system) for current UC San Diego courses. For more information on how make your TritonEd site available to students, go to Make Course Available. For use of Turnitin outside of TritonEd, inquire with your department. The Error 423 message is an integration error that is most commonly received when an instructor or TA has previously submitted assignments to Turnitin as a student, and is using the grader feature for the first time in TritonEd. Send a screenshot of the error message to edtech@ucsd.edu, who will notify Turnitin of the error. Integration errors are typically resolved within 48 hours; however, this timeframe may vary depending on Turnitin's case load. Click Podcast My Course in the left-hand menu. Fill out the Podcast Agreement form. Email EdTech Support at edtech@ucsd.edu to request an individual recording of your Review Session. In your email, include your course's name, the room reservation, and the time to begin and end recording. If you are using Google Apps for Education and would like to request a Google Group for your class, email edtech@ucsd.edu. Include the course code, quarter, any TA names and email addresses in your request. ETS will import your class roster into a Google Group, making it easier to share docs and send email. Learn more about using Google Apps for your course. To learn more about teaching and learning, request a consultation with the Engaged Teaching Hub at the Teaching + Learning Commons. For more information, contact EdTech Support, (858) 822-3315.